Kelley Hagemes is a Painter/ Illustrator (and budding jewelry maker) working primarily in pencil and oil paint (although a myriad of other mediums may sneak in there from time to time). Using geometric shapes, halos, fleshy beings, patterns, various beasts and creatures, she is creating an otherworldly realm with its own set of emblems, mythology and superstitions. Hagemes incorporates a darker side of nature with a soft and subtle sensitivity, blurring the lines of what one perceives as beauty. Recently Kelley has completed a poster for Baroness, and various record covers and logos for projects including Niche and Indie Spiritualist. 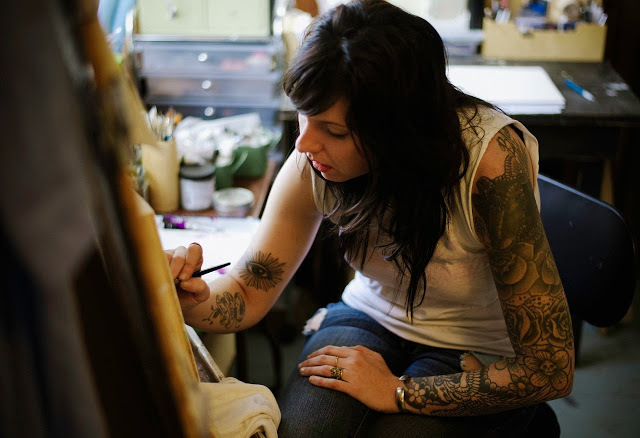 Kelley graduated with a BFA in painting and Illustration from the Hartford Art School in West Hartford, CT. After years of restless meandering, she and her husband traded Brooklyn, NY for Savannah, GA where they raise a their two children and work on various creative endeavors. To inquire about availability of original paintings, jewelry, commissions, freelance work, or just want to say “hey”…please email KelleyHagemes@gmail.com.